Approvals and CE’s Full Circle is accepted through the Alabama Board of Massage Therapy. Alabama Massage Continuing Education Requirements Alabama requires 16 hours of related education every 2 years. Continuing Education must be approved by the board. The courses shall have been completed within the 24 months preceding the date renewal is due. Hours in excess of the total number required may not be carried over to future renewals. The continuing education requirements shall not apply to a massage therapist within the biennium when the massage therapist is first licensed, but shall apply to licensees every biennium thereafter. 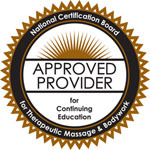 As of August 9, 2013, the Board has approved the acceptance of examinations offered by the National Certification Board for Therapeutic Massage and Bodywork and the Federation of Association of Massage Therapy Boards.